Are you looking for a way to make travelling easy and more manageable? GPSmyCITY iOS app is here to make it happen. GPSmyCITY is an iOS travel app that makes touring easy. This app features a collection of GPS-powered articles written by famous bloggers and writers in the world. This wonderful app consists of offline digital maps and great navigation support. Cities are usually overwhelming to visit, because there are so many things taking place there. Most cities are full of beautiful landmarks, hotels and tourist attraction sites. However there hidden stunning spots you need to find out. GPSmyCITY is here to guide you through all the city spots. 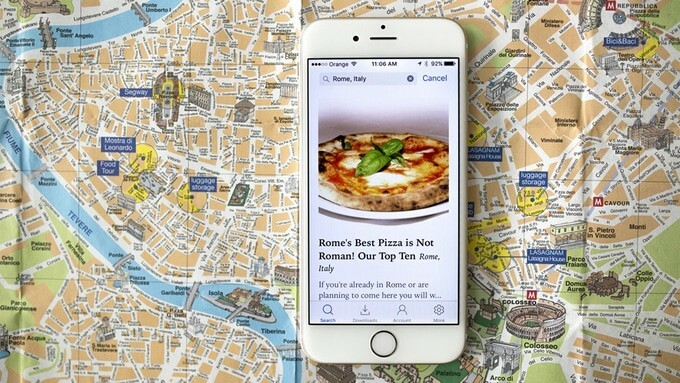 Detailed tour route maps- This iOS travel app travel app, features offline digital maps that grant you access to numerous self-guided walking tours, to see the best of your favorite cities. Powerful navigation features- The app also features powerful navigation features to guide you throughout the entire city. Built in data– You can use the city map or follow the tour guide without a cellular data plan or internet access. Data used in this app is built into the software. Thus you don’t have to pay data roaming charges when travelling outside your country. Optimization- for both IOS and Android phone or tablet. The app is very easy to use, with a simple click of a button; the GPS-powered travel article will give you a guide throughout your precious city. It will provide you with even the tiny details, like where to eat your favorite dish. Your account will be linked automatically to the first device(s) you used to log into the GPSmyCity app. However, link new devices in your account settings by unlinking your previous devices. Thus, you can to easily transfer your account in case you lose your old device(s) or upgrade to new device. PREMIUM MEMBERSHIP- This is a single account that allows use of two devices simultaneously; for instance a tablet and a Smartphone. Reduces the cost of hiring a tour guide. City walk app is a great app for self-guided tour. All you have to do is determine where you are travelling and prepare materials needed and you are good to go. Thanks to GPSmyCITY app you can discover and learn a lot about your city without a tour guide personnel. Download this app and you are ready to travel to any city in the globe. The mission of City walk app is to give everyone in this world a chance to be their own tour guide in various cities. Do you love travelling and exploring the natural earth beauty? With this app you can enjoy and explore the entire world while having the knowledge and confidence of where you are going. Buying each article is very expensive but you can reduces those expenses by backing GPSmyCITY on kickstarter, which will grant you full access to all the GPSmyCity articles for just $60, which is less than 1% of its all articles total value.